Sydney based artist, Paul Davies creates mesmerising paintings that I can't help but get lost in. He also makes amazing steel structures that emulate the woven line work you see in his works on canvas. His subject has remained the same over the past few years - geometric architectural structures and pools surrounded by trees and palms. It's Paul's approach to these works that makes them so magical. Working with acrylic paint, Davies applies layers and layers of colour to large scale surfaces with the aid of stencils, which he meticulously cuts. His approach is a calculated step by step process that produces gorgeous combinations of colour and watercolour-like marks. Paul works from the China Heights Studio in Sydney's Surry Hills alongside other talented creatives Edward Woodley and Kyle Montgomery, and recently I had the opportunity to see his work in the flesh and have a chat with the modest artist himself. To see the work up close and personal and hear about Paul's process made his work that much more appealing. If you get the opportunity to see Paul's work I don't doubt that you'll feel the same way as I do. 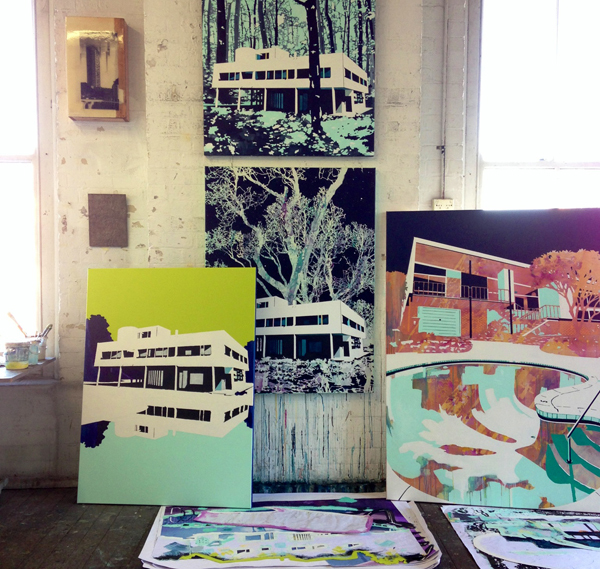 Keep an eye out for his contribution for Olsen Irwin Gallery as part of the Sydney Contemporary Art Fair, which is held at Carriageworks from Sept 19-22.